8.5ft X 25ft Flatbed Gooseneck 7 Ton Trailer, Mega Ramps, Steel Beavertail, in Red! 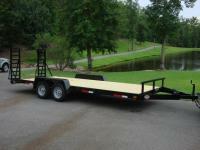 Flatbed Equipment Trailer 8.5ft X 25ft Goose Neck 7 Ton, Wider Adjustable Ramps! Macon Custom Trailers & Golf Carts has been visited 9,651,169 times.